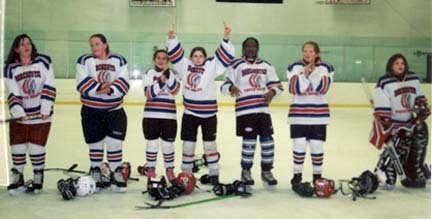 Lady Chiefs: The DYH 12 and under squad celebrate their victory over Canton. Photo courtesy Matt Sweeney/DYHThe Dorchester Youth Hockey girls 12 & under team defeated Canton today for the South Shore Championship. The Lady Chiefs took home the title thanks to a third period goal by Brenna Galvin to tie the score at 1-1. Then in overtime, Katie Nolan scored on a power play goal to win the game. Coach Driscoll raved about the goaltending of Patrice Guerarde and the defensive play by the entire team. Great job, Lady Chiefs!